The failure in many cases is not down lack of resources and budget BUT in fact down to a lack of engagement between Procurement / Supply Chain / IT and their colleagues in Operations / Category Management at the early stages of the initiative. Its like the business functions responsible for working together in developing, implementing and ongoing running of the initiative are / were operating on different planets and speaking different languages, or not speaking at all. Sadly as a result the Initiative fails and the investment (Time, Effort, Cost) is lost. The Major characteristics of SPM / SRM initiatives where the ROI is high and the payback period is relatively short is where all the functions are aligned to a common goal, where they have mapped out all the challenges, and where the green light to go has not been switched on until all stakeholders including suppliers have bought in fully into the Initiative. Thankfully there are quite a few Oil & Gas companies in Upstream, Downstream, and Midstream that act as positive case-studies that one can take lessons and best practices from their experience. 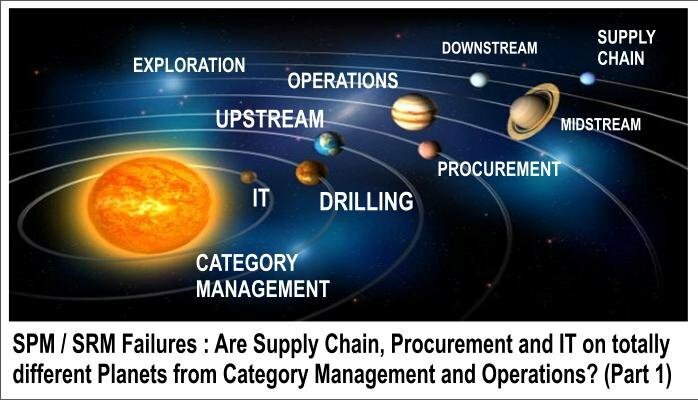 Without proper planning and stakeholder alignment there does seem to be a higher rate of Initiative failure for some of the more complex Upstream Category lines ( Drilling, Completions, Geophysical, and Subsea) as compared to the category lines we see in the areas of indirect procurement within Downstream and Midstream. The main reason I find for this failure is that the Initiative is NOT actually “Measuring and Managing what Matters” at the Category Line or Local operations level. This is often down to the simple fact that Procurement / Supply Chain devised a scorecard and associated KPis without first engaging say the Drilling Managers. Or to put it more bluntly they have devised a scorecard with KPIs from a Supply Chain Book that seem to work across the business but now fails to meet the objectives of the Drilling manager in managing complex category lines. As a result we have a scorecard and KPI report that may meet the corporate objectives (having some high level global KPIs for say COST, HSSE, DELIVERY that are globally comparable) BUT this is off little value to the folks managing the day to day operations of say suppliers for Cementing , Drilling Fluids, or Drilling Rig Category lines at the local level. If you want to cater for both Global and Category Line specific KPIs then the below diagram provides a good illustration of how you can cater for this without the need for complicated scorecards that contain KPis that are of little use to that Category Line. its essentially allowing you to compare apples with apples across category lines (yellow box) but giving you the flexibility to add category specific KPIs as well for the respective product or category line, even locality specific KPIs. 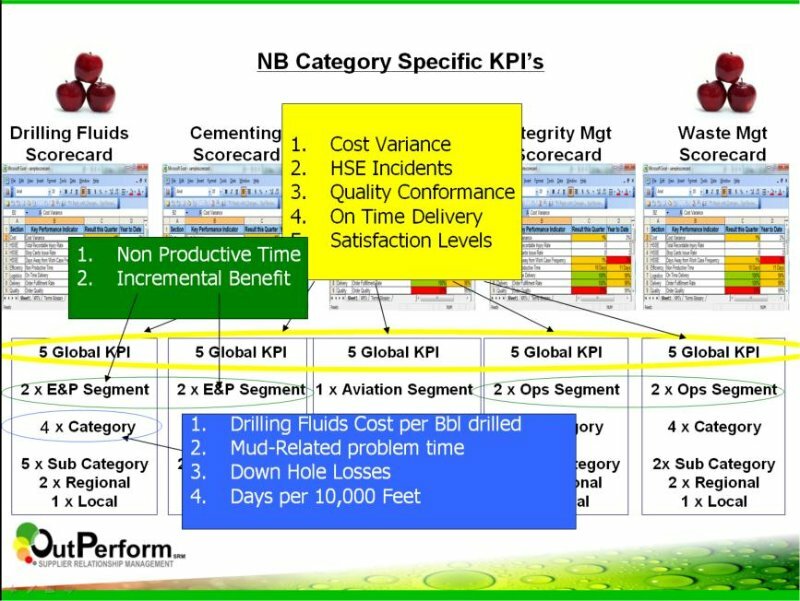 What is important here is that whether you are in procurement and focused on COST KPIs , in Supply Chain and focused on Ontime Delivery, or in Drilling Department and focused on Days per 10k, or NPT the scorecard should be dynamic so that when created on the fly for the specific category line in question it knows what questions to ask the supplier, even at regional or local level (region or local specific KPIs). Yes ask the supplier for the corporate KPI data but Don’t overburden the supplier with questions / data that does not add value to either corporate or category line. 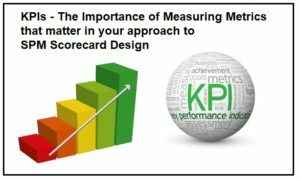 Limit the scorecard to collecting KPIs that Matter. Other failed Initiatives gave the excuse that they suffered from factors such as lack of Top Level Mandate / Support, Competing BI Initiatives, Scorecard Complexity, Scorecard Overload, Data Availability, Workflow Effort, Low Supplier Buy-in, Lack of Automation, Technology / Hosting / Maintenance challenges. While I may agree with these being contributory factors they are easily managed and in my view the mainreason for failure is lack of co-operation between the IT, Procurement, and Supply Chain, with the Category management / Operations functions. I am not looking apportioning blame to any particular role within the initiative, each has their part to play, and each must understand that there is a huge business impact in not getting this right. Its about working together better during the concept stage, building the business case, and working collaboratively to deliver the end goal of improved Category Management, Relationship Management, improved Performance, and better access to timely information to reduce risks and improve the overall supply chain management process. Scope of Initiative / Competing Initiatives. In the mean time if you have any experiences / suggestions around the article feel free to like, or share this post or better still leave a comment / question / suggestion. Also keep any eye out for the other adhoc articles I post on SRM, SPM, e-Procurement, and Supply Chain Data Management. See List below.